When I first entered this particular gallery at the Art Institute of Chicago, the large painting across from the entrance made me smile. And then I sat down on the bench across from it to contemplate the gorgeous urban scene. The rainy day vista was a snapshot of a Paris long gone. And it was beautiful. 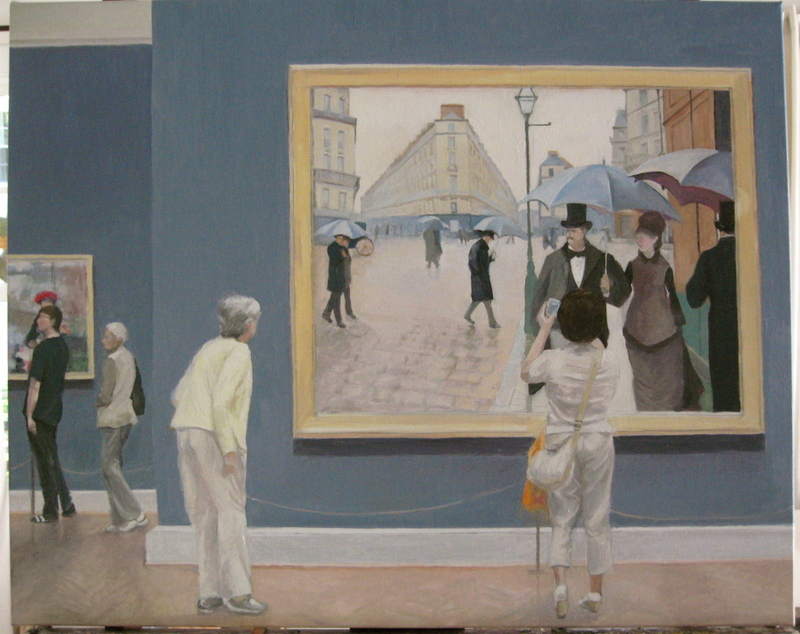 The museum had just finished a major restoration and cleaning of Paris Street; Rainy Day by the French artist Gustave Caillebotte. 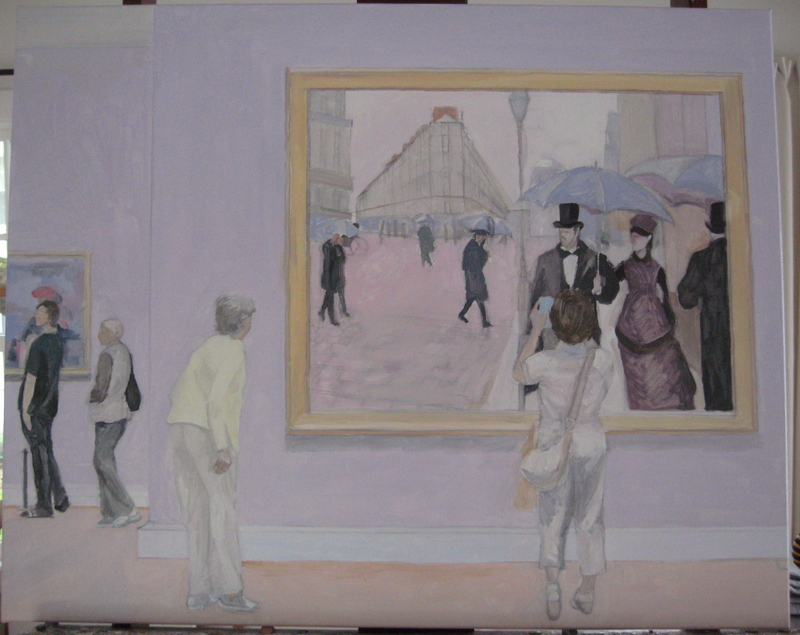 One of Caillebotte’s best known works, the 1877 painting depicts what was then known as Carrefour de Moscou, a road east of the Gare Saint-Lazare in north Paris, now called Place de Dublin. When you first walk in to the room, the painting immediately grabs your attention. The blue-gray walls push it off the wall, and you feel like you could actually enter the boulevard itself with madam and monsieur. 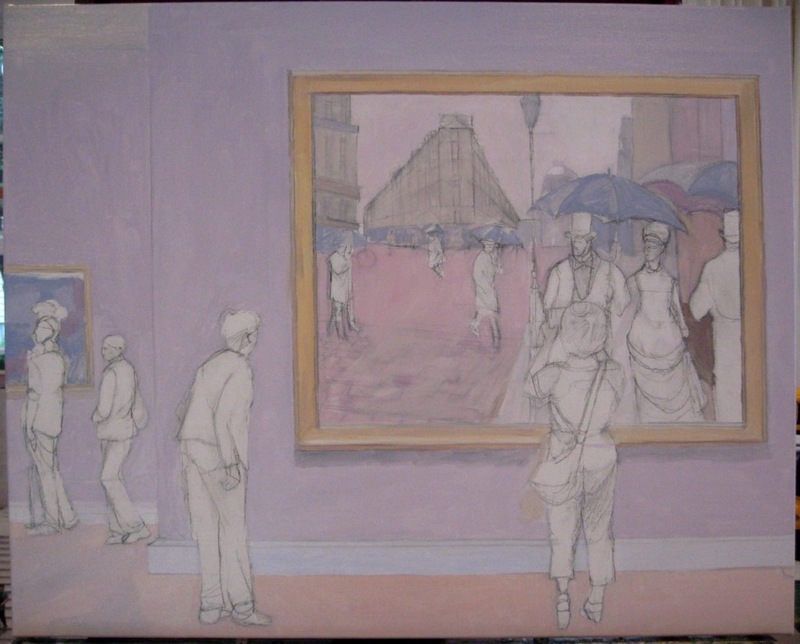 I used a lavender pink underlay to set the cool, soothing tones of the rainy streets before putting the strong, deeper blue layer on top. I was afraid that when I put the actual blue-gray color of the gallery walls in, it would overwhelm the painting and the figures. But, as is the case in the actual room, it works. And the cool underlying tones do push through and the blue on the walls draws out the figures and their umbrellas in the painting. 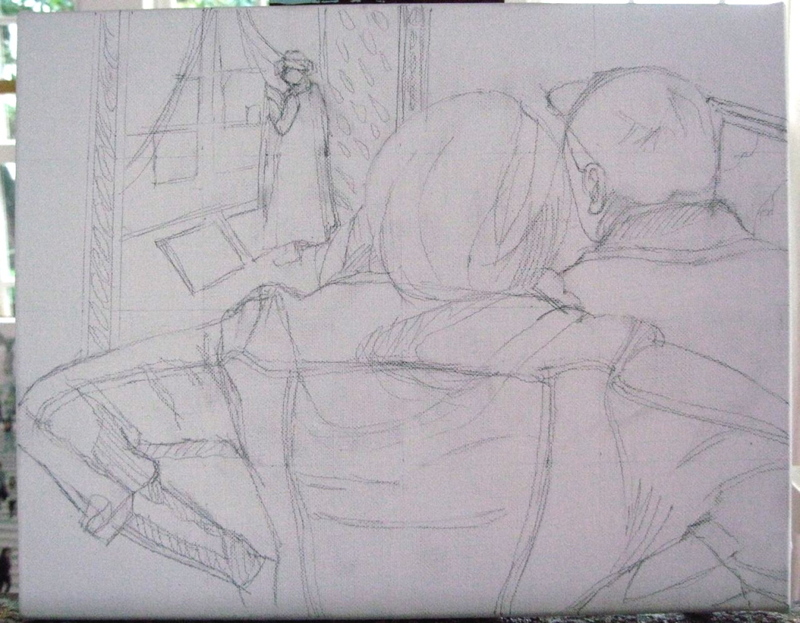 I sat across from this picture for a long time, watching the people come into the room. Like me, they were immediately snapped to attention by the charismatic figures on the Parisian street. I loved these two women looking at the work, possibly a mother and daughter. One is lining up her photos, while the other leans in to stare at the painting. 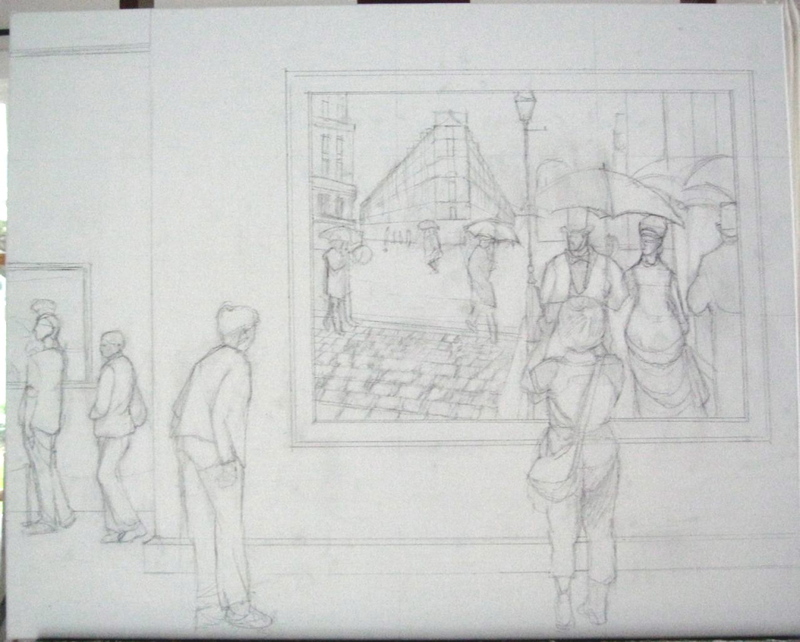 Their detachment from each other mirrors the isolation of the figures on the Paris street. They seem to be together, and yet each is in their own world. Maybe things have not changed so much. 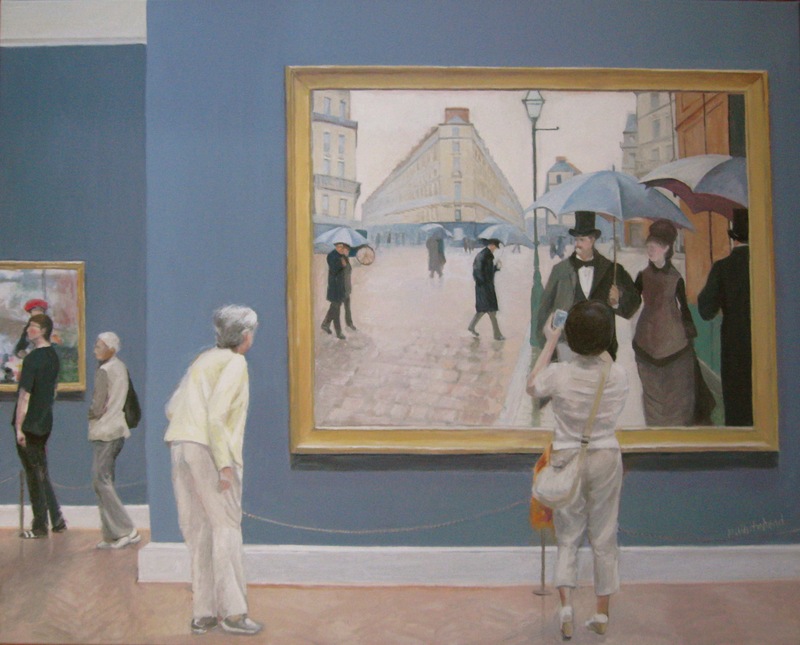 There is something about the way people view art in museum galleries that fascinates me. Each person has their own way of circling and then approaching a piece. Some gaze, some study with great intensity. What are they trying to see? The content, the technique…? Some people dash by, and take a quick pic on their phone. But others linger, like this couple who put their heads together and peered at this mesmerizing Edvard Munch pastel “The Girl by the Window” (1893) at the Art Institute Chicago for many long moments. Munch’s piece is special. 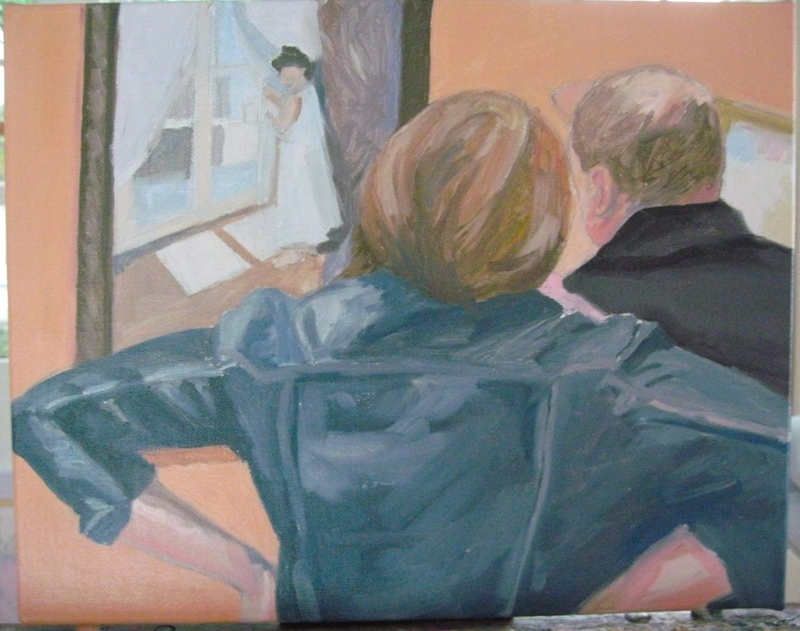 The young woman in the painting is looking out her window. We are not sure at what but it is mysterious and hidden by the night. 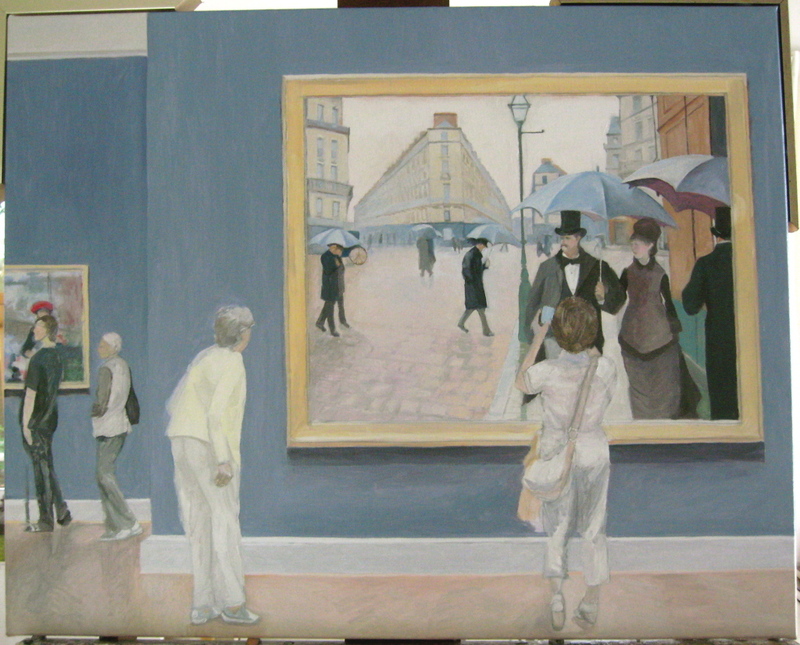 Obscured by the art lovers is a dark shape which could be a chair, or another person looking at the girl in the lower right hand corner of Munch’s painting. Our viewers have taken its place to add to the complexity of watching going on. 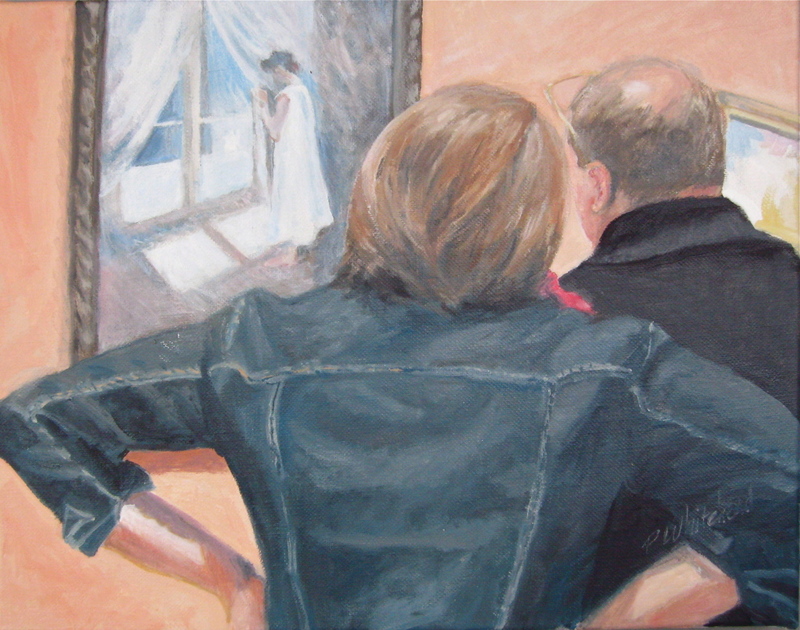 It is a piece that is many layered and takes a long time to view and try to figure out the whole scenario. Our couple is trying.